This book had me laughing from start to finish! It’s entertainining yet informatinve.Even if you don’t love Forrest (how can you NOT love Forrest?) you will love his book. Don’t expect much on MMA training or technique but it certainly provides useful information that blend with hysterical stories and anecdotes. Griffin’s humor and unique writing style make for an extremely entertaining read that will you have you laughing-out-loud until your sides hurt. I recommend “Got Fight?” not only to MMA fans, but to anyone who has a sense of humor. 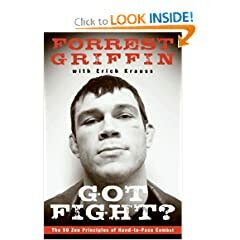 Firstly for those who don’t know who Forrest Griffin is, he is the most beloved fighter in the sport of MMA. He won the first season of The Ultimate Fighter in 2005. He’s a political science graduate from the University of Georgia and a former police officer. This book had me laughing from start to finish! It’s entertainining yet informatinve.Even if you don’t love Forrest (how can you NOT love Forrest?) you will love his book. Don’t expect much on MMA training or technique but it certainly provides useful information that blend with hysterical stories and anecdotes. Griffin’s humor and unique writing style make for an extremely entertaining read that will you have you laughing-out-loud until your sides hurt. I recommend Got Fight? : The 50 Zen Principles of Hand-to-Face Combat not only to MMA fans, but to anyone who has a sense of humor. Overall, I learned about true mental toughness (whether it’s fighting in the Octagon or picking up chicks) while having a laugh. If you have read “Got Fight?” take a look to these other great MMA Books .